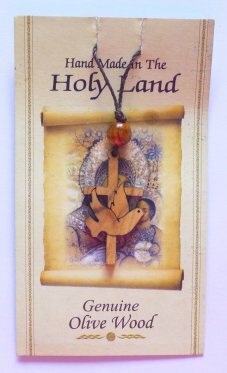 DIRECT FROM LOURDES - Hand Made in Bethlehem a Olive Wooden Cross with Dove Pendant. Hand Made in Bethlehem a Olive Wooden Cross with Dove Pendant. Hand made in the Holy Land of Bethlehem a olive wood cross with dove pendant. The pendant comes on a thinner cord that can be re-knotted for an adjustable length. Olive Wood is mentioned time and again in the Bible. Out of great Biblical reverence, olive trees in Israel are not permitted to be cut down. All olive wood items that are made from the holy land are from pruned branches which keeps the trees healthy.